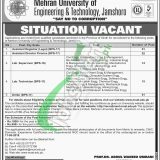 Applications are invited on a contract basis from MUET Jamshoro Jobs 2019 Mehran University of Engineering & Technology. For all the applicants who are looking for jobs in the Mehran University of Engineering and technology so pay your attention here because the university is in the probe to hire the highly educated and experienced individuals for the following positions. Currently, the posts which are vacant to be filled are named as (Assistant Registrar (Legal), Assistant Director Finance, Lab Supervisor, Lab Technician, Driller) are the posts which need to be filled as soon as possible. The overall qualification of Masters and Bachelor's qualification from the well-recognized institute with relevant per field expertise are needed to apply for such posts. Now, I will let you know about its further details below. Interested and willing applicants are required to apply online from the official site or from the given link below. The last date for applying is May 17, 2019. Candidates need to attach Bank Challan of Rs. 1000/- for BPS-17 and Rs. 800 for BPS-11 to 16. Govt employees, autonomous bodies, and public sector employees should route their application through proper channel. Last Date To Apply: May 17, 2019. Address: Mehran University of Engineering & Technology, Indus Hwy, Jamshoro, Sindh 76062.